Thatcher holds a BA and LLB from the University of KwaZulu-Natal and a Masters in Law from the University of Cambridge. He initially worked as a prosecutor before joining the KwaZulu-Natal Bar in 1985 where he still practises as an advocate. He was conferred silk in 2014. A member of the Maritime Law Association, Thatcher, who unsuccessfully interviewed for a position on the KwaZulu-Natal Bench in 2015, is likely to be quizzed on maritime law and the perception that it one of those niches in law which remain the sole preserve of pale male lawyers. After returning from Cambridge in the early 80s, Thatcher completed two years of national service in the South African National Defence Force — something that is certain to lead to uncomfortable questions during his interview. His civil trial specialisations include contract law, property law and maritime law. 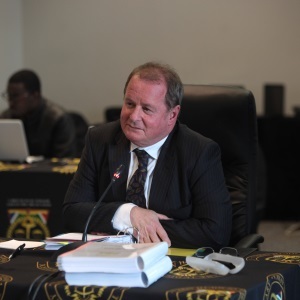 Thatcher’s lawyering experience includes representing companies contesting the awarding of government project tenders including the Moses Mabhida World Cup Stadium in Durban and the city’s new King Shaka International Airport. Thatcher has acted in the KwaZulu-Natal High Court on several occasions over the past five years. In the 2015 matter of Ethekwini Municipality V Gumbi and Others, the local municipality sought an eviction order against occupiers of a tract of land which it sought to develop for low cost housing. The question the court had to decide was whether, in the circumstances, it was just and equitable in terms of Section 6 of the Prevention of Illegal Eviction From and Unlawful Occupation of Land Act (PIE) that an order be granted for the eviction of the respondents. He found that while some respondents had been built a house by the municipality, there was nothing in the papers to suggest that those who were not built houses would not be able to find alternative accommodation. He granted the eviction order. Advocate Glenn Thatcher’s interview lasted approximately twenty minutes. He has previously appeared before the Judicial Service Commission (JSC) where tougher questions were asked about his serving in the South African National Defence Force during apartheid, his views on transformation and so on. The records of candidates’ previous interviews are made available to commissioners so it sometimes accounts for the shortened length of interviews. Thatcher told the commission that his major contribution to the Bench, if appointed, would be to the “more effective running of the courts” through his own output and “individual case management”. He acknowledged that, being a pale male, he would not hasten the pace of transformation at the Bench “if one is going to count heads, I am what I am” but added that he was someone “who treated everyone equally”. He told the JSC that in cases where he has led black or female juniors, it was because they had approached him and that “it hasn’t been the other way around”. According to Thatcher the size of his practise prohibited him from briefing more black and female junior counsel.